Creativity is something we have in common, but at the same time, creativity works differently from one person to another. You might hear people say that this person is more creative compared to that person, but actually, the measure most people use in determining the said creativity is their uniqueness. Uniqueness makes an individual’s work stand out from the rest. Some might even call the uniqueness weird, extraordinary, or unusual, but the important thing is to be confident in your own skin and in your own work. During their early ages, our children don’t really wonder about the mysteries of the great beyond on the spot, but first they learn to explore the world and slowly uncover and learn different things. These things that our children have learned, seen, smelled, touched, and experienced then influences our children’s creativity with respects to our children’s understanding and interpretation. Hearing kind words of encouragement encourage children to do more. This promotes self-confidence and even independence in the children’s capability and trust in the self. Nurturing your children’s creativity and confidence in their work doesn’t have to be limited to just one setting. One great way to spend time with them is on vacations and even on just day trips to parks, museums, and other places that will allow them to learn about different cultures, see different arts, and hear different songs and music. As parents, we worry about what state our children might be in or what they may face during exploration. This can hinder us in giving them the encouragement to learn, explore, and be independent. As parents, these concerns are always understandable, this is why children should be encouraged to explore but not left alone. If work calls during these times, then it would be of help to find a provider of certified professional Child Care in Bowie, MD that can help ease your concerns as a parent. Expose your children to different activities that allow them to interact and learn alongside other children. Besides the fact that finding and making friends are important, different activities are also sources of knowledge and can help nurture our children’s creativity. Summer programs for example offer activities related to arts and crafts such as scrapbook making, dance class, storytelling, and more. 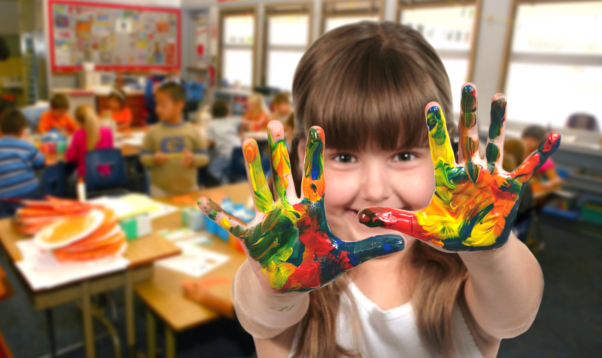 We would want to nurture our children’s creativity starting from a young age to help nurture it. Sometimes we forget, but it’s always good to remember that our children are the future. Our children are the dreams of the previous generation. They need to learn history, arts, science, math, and all of that in a way they can truly enjoy. One Step Up Early Child Care LLC helps create a learning environment where your child can grow and have fun at the same time. Enroll your child with us today by visiting www.onestepupearlychildcare.com or call us at 301-459-8296. This entry was posted in Child Care and tagged early education, Infant Care, Kindergarten, Summer Programs, Toddler Play Group. Bookmark the permalink.